If you’ve ever watched an episode of classic Star Trek, you’re probably familiar with the old adage, “Don’t wear a red shirt.” Odds are you won’t survive until the first commercial break. John Scalzi’s latest novel Redshirts delves into that old adage as well as several other tropes from not only classic Trek but many of our favorite genre series. On board the flag ship of the Universal Union the Intrepid , odds are that if you aren’t one of the five members of the command crew, your life expectancy can be measured in months, if not days or weeks. Crew members go out of their away to avoid any contact with the big five and has developed an elaborate system to disappear when any one of them comes looking for away team members. Newly assigned to the Intrepid is Ensign Andrew Dahl. Dahl is part of the latest round of replacements for those crew members previously killed in action and it appears he and his friends are also doomed to a short life expectancy. But the life expectancy of the crew isn’t the only odd thing going on. There’s the miraculous ability of one of the senior staff to heal from virtually any injury or disease thrown his way in a matter of hours, if not days and then there’s the mysterious box that will give you the almost the right answer to any problem, provided there’s a ticking clock and you show the near answer to the senior show so they can show off their genius and/or technical prowess. Dahl and his friends slowly discover there’s something more at work on board the Intrepid and they’re determined to put a stop to it. As a satire of popular genre television series, Redshirts is a dead-on delight. The novel will have you smiling at times and laughing out loud at others. And if all Redshirts wanted to be was a parody of the tropes of classic Star Trek, it would be enough. But instead Scalzi goes for something more—a look at how character deaths can impact a novel, series or other form of popular entertainment. Between the moments of great satire and laughter, Scalzi will make you think and re-assess many of your favorite genre shows and look at the importance of getting the science right in science fiction. Scalzi’s novel is one I’ve looked forward to since he first announced its title and premise on his blog last year. My anticipation reached a zenith point when I was able to get my grubby paws on an advanced reader copy and I could only hope that the novel would at least live up to the lofty expectations I had for it. The good news is not only did it live up to them, but it exceeded them. Scalzi has shown in the past that he can write a funny novel. Last year’s Fuzzy Nation showed flashes of the funnier side of Scalzi and his The Android’s Dream starts off with a war between worlds started by flatulence. 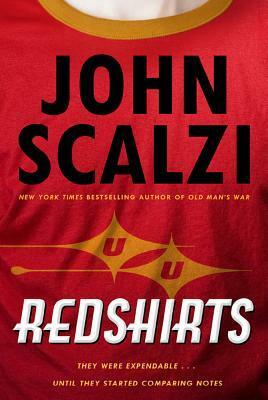 Redshirts is better than both of those (and they’re my two favorite works by Scalzi so far). And that’s all before you get to the three codas Scalzi includes after the main story is concluded. Each one adds a unique twist to the Redshirts universe and while they’re not essential to the main story, they’ll add a lot to your enjoyment of the Redshirts universe.